Sold by eu.bayite and Fulfilled by Amazon. Gift-wrap available. 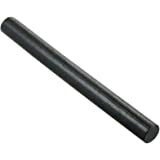 Amazon's Choice for "ferrocerium rod"
Don't use bad quality Knife as striker. 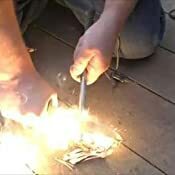 Otherwise it will not produce enough sparks due to insufficient hardness of blade. 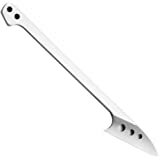 You can also use the back of a blade from an art knife. That's the most efficient scraper that can be found easily. Sold by eu.bayite and sent from Amazon Fulfillment. 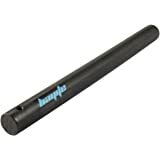 Spitfire Pocket Bellows – Compact Telescopic Tube for Blowing Additional air into a fire for Easy fire-Lighting. UK-Made. 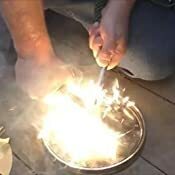 This is a great ferro rod and produces a really good shower of sparks when a hard knife spine is used to scrape it (see video and pictures). 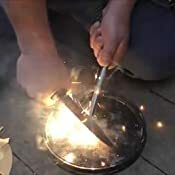 The supplied scraper gets a reasonable amount of sparks flying but is really not up to the job when compared to the back of a knife so I'd only recommend using that if you didn't have a decent knife handy. The supplied paracord handle is a nice touch and I'm pleased with this purchase - see the video where the sparks actually light the black plastic lid I was using to film against...now that is serious heat. This would be a great rod for kids to use as they often get frustrated with small rods when they don't light natural tinder very well due to limited sparks. It's pointless testing this rod on cotton wool as even a feeble spark will ignite that but trust me this will light anything you'd normally use as naturally sourced tinder very easily - highly recommended. 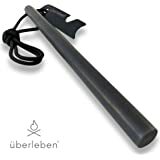 I had the Gerber Bear Grylls fire starter, I thought to get another one to test. This one costs the same as the Gerber when I bought it. 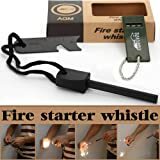 I initially got the Gerber fire starter, it was my first fire starter and I was very impressed. However, few days ago I wanted to get another one to compare, so I bought this. And wow. I cannot believe the difference between the 2. I literally want to throw my Gerber fire starter away just because of how good this one is. It spits sparks with the striker it comes with, which is really good, it works very well with it. 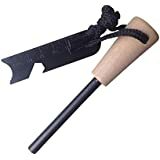 To test it I made wood shavings and feather sticks, it takes 1-2 strikes to light the fire every single time with the bayite. With the Gerber it takes me 10-20 strikes, and it just made me think of how small the Gerber one is. With the striker it comes with and the amount of sparks it produces effortlessly, I recommend this to everyone. This is now my 'go-to' fire steel. No handle to fall off if the glue melts inside; extra thick bar that will probably double or tripple the number of strikes compared to even some of the better ferro rods out there. 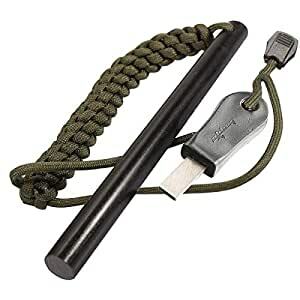 Good braided chunk of proper 550 paracord is included, and one of the strikers I prefer with a nice sharp edge that creates a real blast of hot metal. I've swapped the standard paracord for a lanyard of fire cord, so the whole thing includes some emergency tinder. I'm a lightweight enthusiast but for fire-making, it's a principle I choose to overlook. 5.0 out of 5 starsLong, strong and very hot! These seem to be an excellent product. They throw a very good spark shower. I bought 2 plain ones. Then this one with cord and striker I have just invested in 5 more plain ones. I run a bushcraft and survival school in Devon and will test them out on a few courses. If as I suspect they are a real improvement on the ones I use currently then I’ll stock up. 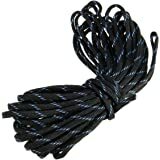 If I had a request it would be to have a bright coloured 550 cord. I’ve just got some bright yellow 550 and ordered the excellent strikers. We are not all worried about stealth and students have a tendency to put them down or drop them. The woods must be littered with Light my Fires that have been dropped or come out of their handles. So a hole and bright cord is definitely the way to go. As part of a Scout competition, I was in charge of a fire lighting base. Scouts and or leaders were to light fires without matches etc. Many tried and many failed. Out came my big boy, Bayite ferry rod on steroids, ooooh the gadget envy from others, many jealous glances in my direction. Best ever tool for Scouting I have ever purchased. At one stage I managed to ignite some cotton balls from a standing position. 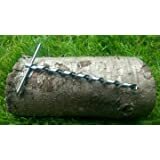 5.0 out of 5 starsReal deal ferro rod, throws huge sparks. 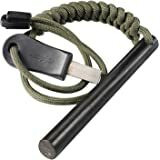 Throws gigantic sparks, using either the supplied striker or a Mora Bushcraft Black. 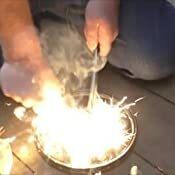 Ignites basic feather sticks, cotton balls, etc, probably any of the fire start hack materials.